Quality is something your customer desires and you want to offer. We often hear advertisements claiming "Offering Quality Service for over 20 years!" But what does quality really mean when it comes to a small business? If you were to ask ten businesses owners to define quality, you would get ten different answers. Some will focus on zero defects. Focusing on zero defects is a noble ambition, but it is an internal action and does not take into account the customer’s needs. Some will mention using the finest materials. Does this mean a low-cost product or service has little or no quality? 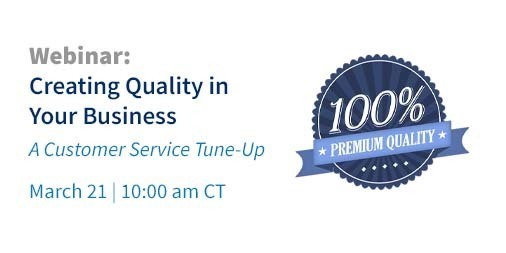 This customer service focused webinar will take a different approach to defining quality and show you how to use it to meet your customer's expectations.